Congrats to the GKB Army Ten Miler team. 22nd out of 59 teams with some great finishes: Charles Rugg-1:07 followed by Jen Zanghi-1:11. The entire team finished within 12 minutes of each other for a great gap time. Cris Coveleski, Tim Nevin, Russ Austin, David Voorhees, and Erin Lynn McTarnaghan, all finishing 3-7 on the team respectively. Congratulations to all of you. 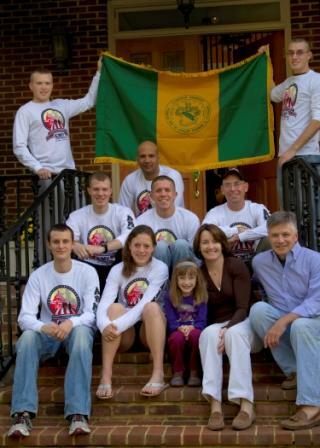 The Golden Knight Battalion runners from Clarkson’s Army ROTC Battalion attended this year’s Army 10 Miler held in Washington DC on the 24th of October. This was the 4th consecutive year that the Battalion sent a team to the event. The trip was made special this year by the support received from the Clarkson Alumni family. This year the team was housed and fed by the Parker family. Kevin, Anne, and daughter Kate provided a place to stay, and some great meals for the team of 8 runners and 2 cadre who made the trip. Kevin is a Clarkson Alum, and sits on the board of trustees. The team was also sponsored by the Fort Drum Chapter of the Association of United States Army (AUSA), who provided funding for transportation and incidental costs. Our many thanks to Joe McLaughlin, President of the chapter. Joe’s son Mike is a product of the GKB, currently serving in Iraq, and his wife Marilyn, who ran the race, managed to raise my spirits at the 7 mile mark with her enthusiastic greeting . This year the team members were among 30,000 runners who registered for the race held in the nation’s capital. 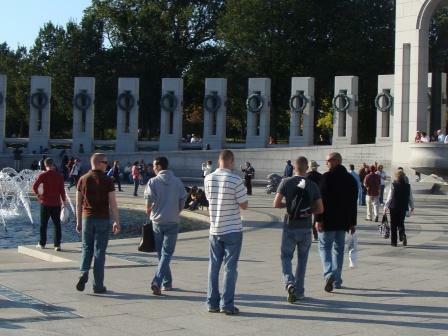 The race starts and ends in the parking lot of the Pentagon and the route takes runners past many sites in Washington DC, to include the Capital, Lincoln Memorial, and the Smithsonian Museums. The Clarkson Golden Knight team was made up of senior Charles Rugg, Information Systems & Business Processes, Penfield, NY; senior Jayson Keys, Mechanical Engineering, Marion, NY; senior Erin McTarnaghan, Biomolecular Science/Chemistry, Geneseo, NY; junior Jennifer Zanghi, Mechanical Eng., Cassadaga, NY; junior Russell Austin, Innovation & Entrepreneurship, Canandaigua, NY; junior Tim Nevin, Innovation & Entrepreneurship, Canandaigua, NY; junior Cris Coveleski, Global Supply Chain Management, Utica, NY; sophomore David Voorhees, Environmental Engineering, Buffalo, NY. 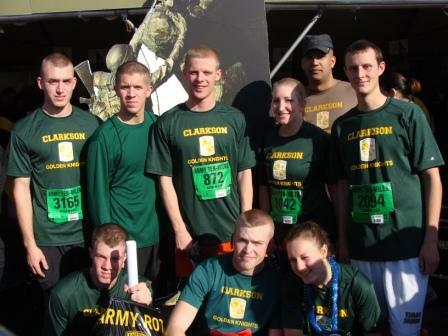 The cadre runners were Major Scott Toth, and 2LT James Onley, Clarkson class of 2009. Next Alumni, Attention! Drop and Give Me Twenty (Bucks)!